It’s hard to know where to begin with this review. Maybe it’s with Flo Groberg, one of the authors whom this book is primarily about. Perhaps it’s with the our war in Afghanistan. Or maybe it’s with the Gold Star families and our brave soldiers. All intertwine, and Groberg, along with Tom Sileo create a powerful retelling of Groberg’s experience as a soldier in Afghanistan, of those we’ve lost, and of coming home. I attended a USO benefit recently, 8 Seconds of Courage was given out at each seat, and Groberg was one of the keynote speakers. His charisma and energy had the large audience completely rapt. Hanging back after the dinner was over to catch up with people, over walks Groberg, so I asked him to autograph two books, and we spoke for a few moments. This young man has enough positivity and drive to power a rocket; and genuine excitement for the future. As he demonstrates in the book, his care for his finance Carsen is endless, and he mentioned their engagement to me. So, I knew the book was jumping to the top of my “to be read” pile. I stayed awake nights to read this. I couldn’t wait to reach the end, then hated when it was over. It’s that good. I read Jennifer Egan’s A Visit from the Goon Squad several years ago and liked it well enough. 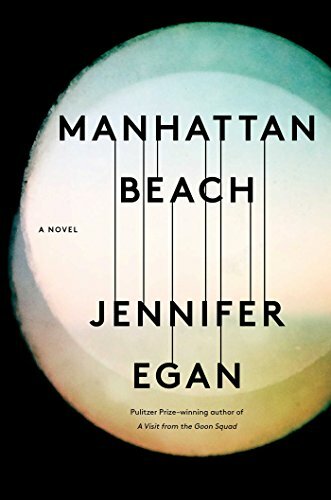 Egan’s latest, Manhattan Beach, far exceeds its predecessor. Egan's first work of historical fiction was diligently researched over several years, and takes place in New York as World War II breaks out. It crosses time and oceans chronicling a famous gangster longing to do good; a father entwined in a gangster’s life he cannot sustain; and our imperfect heroine, whose strengths and smarts lead her from childhood to adulthood. The war itself is a character as well, propelling the lives of those left at home to support the “innocents” sent to fight, manifesting patriotism in even the most cynical, and fastening together the diversity of New York that would otherwise remain apart. Anna is a child when the story begins, her father, Eddie, making ends meet as a bagman for a small time gangster. A loving relationship, Eddie takes Anna along for many of his drops. This ends suddenly however, when Anna turns 14, and Eddie begins employment for one of the most prominent gangsters in New York, Dexter Styles. A dangerous path, clearly, but it allows Eddie to financially provide for his family, including Anna’s younger, disabled sister Lydia. One day, Eddie doesn’t return home. Years pass, and after Pearl Harbor, the war effort is in full swing. Anna fills a role in the Brooklyn Naval Yard measuring ship parts; a job much too mundane, but she enjoys being part of the war effort. Through mighty will and perseverance, she becomes the first female naval diver, making ship repairs underneath the water’s surface. As Anna is discovering herself as a strong woman in very much a man’s world, she navigates the extreme chauvinism of the 1940’s, acceptance of her father’s disappearance, and meeting the gangster with whom her father was involved. Along with a supporting cast gleaned from interviews of people who lived and worked in Brooklyn supporting the Naval Yard, Egan weaves their real stories into a captivating plot. 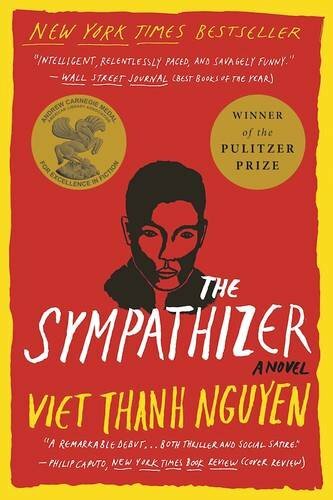 Egan’s characters are beset with intersecting conflict and humanity; her writing and pace excels. She has uncanny ability to surface and convey emotions in the subtlest of ways; possibly the best feature of her writing. Manhattan Beach is without a doubt, one of the best books I’ve read in a while. 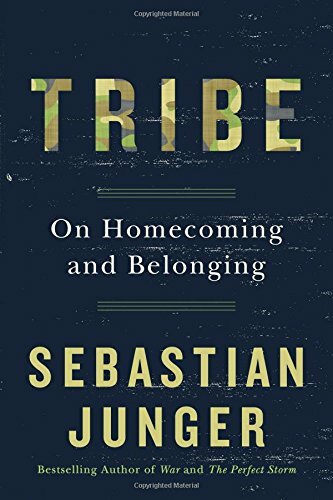 If you didn’t read Sebastian Junger’s book Tribe when it came out last summer, read it now. It will only take a few hours, but will leave a lasting impact. Tribe articulates the meaning of the word, its the historical and modern implication, and how a sense of tribe in our personal lives makes us more resilient, better human beings. Junger’s book covers native American Indian tribes, soldiers returning home from war, citizens living through war, and contemporary civilization; and he examines why and how humans thrive in “tribes” and suffer in modern society. Small tribal communities promote caring and egalitarian values, while today’s culture advocates wealth and technology, fostering competition and isolation. This has vast implications on our mental and societal health. As a journalist in combat zones, Junger has seen the horrors of war with both troops and citizens native to those war zones. It’s something he poignantly touches on in describing his own experiences. Most of us don’t experience extreme hardship and cannot relate to those returning from embattled zones - whether soldiers, journalists, or peace corps. Reentry into their homes where life has continued is a shock and struggle. The sense of community and common cause while away is gone, often replaced with loneliness and isolation. Aid organizations, including the Veterans Administration, put labels on those who have experienced trauma as victims. Junger’s research has exposed that the idea of victimhood is detrimental to the recovery process, and yet another way of alienating someone from the rest of society. Junger also explores cultural hierarchy in modern society. He questions why construction workers, for example, have a higher perceived importance than stockbrokers. Construction workers after all, provide our shelter and are far more impactful to our everyday life. Calling this out, he points to a general lack of understanding and disconnectedness to many industries and jobs outside of our immediate purview, whether it is as a soldier, construction worker, farmer, or child caregiver. “This lack of connectedness allows people to act in trivial but incredibly selfish ways,” he says. Tribe dives to the heart of societal issues - historically tribal cultures thrive mentally and emotionally. Generally, we may live in a financially prosperous world, however it has come at a significant cost to our psychological well-being. People benefit from companionship and a strong sense of belonging; especially to recover from trauma. Modern society does not support a high level of social support that helps to build resiliency. Tribe is a thoughtful piece and has me contemplating my own tribe. Do I have one? How has it evolved from ancient tribes? Have I benefited or suffered? And how do you create a meaningful tribe while maintaining a life in the midst of a competitive environment. It’s sobering, and I highly recommend it. It took a bit of effort to engross myself into That Bright Land. I had just finished reading Amor Towles’ new, very formally written novel (review coming soon), and switching gears to this post-Civil War drama written in the voice of a Union soldier, turned government man, was stark. But once I made the transition, author Terry Roberts had me the rest of the way. The book is based on little-known, true events. Those in the South had greatly divided loyalties during the War of the States. In North Carolina, where our story takes place, even within small communities, some families chose to fight for the Union, causing great divides within the population and families. The basis for the story is a massacre that took place at Shelton Laurel in Madison County, where soldiers were ordered to execute their neighbors, those some considered traitors. Well, you can imagine the bad blood and ongoing resentments this caused, long after the war’s end. So Jacob Ballard, a former Union soldier, who happens to have been born in Madison County is sent for to investigate a series of recent murders of Union veterans living in the county. They are dropping one by one, and no one can identify who the murderer is. Roberts paints a vivid picture of rural North Carolina in an age of both poverty and growth; of a grand hotel and moonshine running; and the transition from slavery to freedom. Clues to the mystery reveal themselves slowly, and our hero has no technology nor team of experts to assist him. It is pure use of smarts and ingenuity to bring the murders to an end - a very different style than so many popular books today, and a bit refreshing. Along the way, Jacob has his own personal awakening through rediscovering his long-lost roots, finding kinship, and ridding himself of the War’s demons that haunt him so. Some of the more endearing characters could have been better developed, but it was just well enough conveyed to build a well-rounded story. 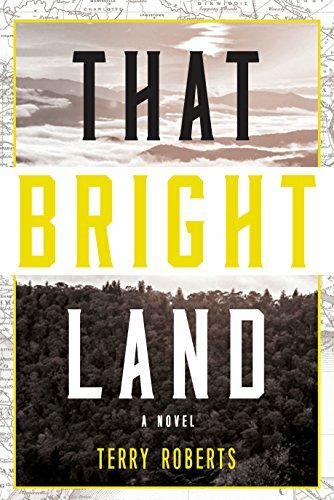 That Bright Land is a solid, quick, and engaging read. I'll get this out of the way at the start. I was teary-eyed at the end. I always love a book where the pace seems to pick up as the end nears; you don't want to finish, but cannot stop until you've reached the conclusion, no matter how much you don't want to. There is a sense of urgency that compels you forward, until the choice is no longer yours. And you're left to contemplate the memory of the events and the emotions they've stirred in you. 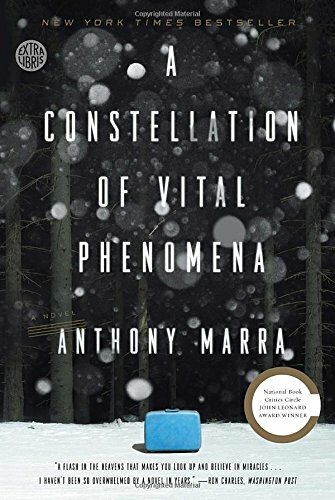 Such is the wonderful writing of Anthony Marra in his novel, A Constellation of Vital Phenomena. The story covers citizens victimized by the two wars of the last 25 years in former Soviet republic, Chechnya. Every step of the way, Marra elicits profound empathy for each of his characters, all of whom are broken and deeply scarred. We have multiple protagonists, and Marra slowly unfurls the psyche of each of them - of how the wars have wounded them both physically and psychologically. He brings together Russian and Muslim Chechens whose lives intersect, conflict, and weave together in unexpected ways. The book begins with Havaa, an eight-year-old girl who is hiding in the woods after her father, Dokka is murdered. Long time neighbor, Akhmed finds her and takes her to safety, at risk to his own life. They find safety in a battered hospital with only one doctor, Sonja, who reluctantly takes the girl in. Over a five day period, we get to know Sonja, Akhmed, and Havaa, among others; and through them, journey through their memories of pain and love; of war and exile; and of traitors and deceit. Marra's telling of events seems so tangible and realistic. He spent time in in Chechnya and did extensive research to write this book, giving the reader a rare and authentic connection to a region we otherwise may hear little about. He deftly brings to us the anguish and brutality of war, along with the effects of mental and physical torture, whether self-inflicted, at the hands of Russian captors, or by human smugglers. Marra carefully brings each character alive with all their shortcomings and fears, poignantly delivering the desperation and longing in each of them. He infuses moments of lightness; whimsy as it naturally occurs, whether a defense mechanism or as irony in daily life lived in turmoil. Some of the most beautiful moments are perhaps when narrating a letter written to Havaa about her father or other passages expressed in first person. Marra uses a poetic voice, so skillfully articulating the emotion of a father's subtly expressed, yet deep devotion to his daughter. Living under the dark cloud of war, occupation, and brutality heightens the senses, dulls sensitivities, and acutely alters human behaviors. We feel them - or as close to it as we can - through A Constellation of Vital Phenomena. The Nightingale is a beautifully written account of WWII France - a broken family, German occupation and survival. This is my first time reading Kristin Hannah’s work, and I was more than pleased. From the beginning, it was difficult to put this book down. The epic opens with this wonderful line - “In love we find out who we want to be; in war we find out who we are”. Sisters Vianne and Isabelle have lived very different lives - one with love and comfort, the other alone and impetuous. Each gets caught up in their own stories of survival when the Germans march in to occupy France. The book follows these sisters and their different paths in a tale that describes the women’s war, heartbreaking loss and the will to live.